Virginia’s Fall 2017 Bobwhite Bulletin is out! Welcome, everyone, to our eighth edition of The Bobwhite Bulletin, your annual update on the status of Virginia’s Quail Recovery Initiative (QRI), a cooperative effort to restore early successional habitat and the Northern Bobwhite population in the Commonwealth of Virginia. Our exciting work is on-going and this newsletter will highlight selected thoughts, ideas and projects from our five Private Lands Wildlife Biologists (PLWBs) and Team Leaders. Native grass forages and our new Working Lands for Wildlife program are just a few of our featured topics this time around. Along these lines, this year’s edition of The Bulletin features a guest article written by J.B. Daniel, Forage and Grassland Agronomist for the Natural Resources Conservation Service. We are excited to feature this article from J.B., one of our state’s top forage experts, as an encouragement to producers to incorporate natives into their rotation and thereby help their bottom line. Nesting habitat for quail and songbirds is just a wonderful side benefit! 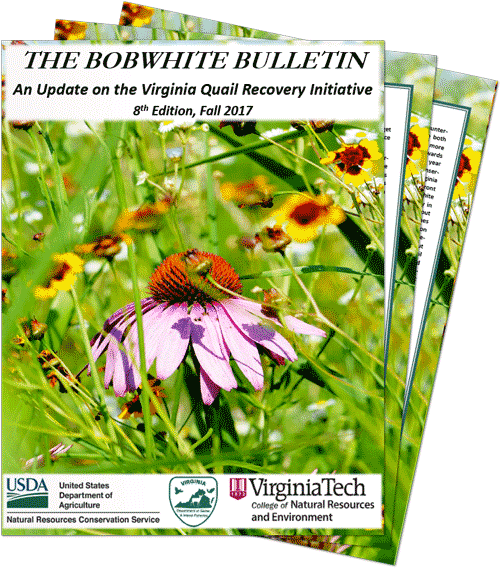 The Bobwhite Bulletin is your electronic update on the status of Virginia’s Quail Recovery Initiative (QRI), a cooperative effort between several agencies, groups, and individuals to restore early successional habitat and the Northern Bobwhite quail population of Virginia. Our exciting work is on‐going and this newsletter will highlight selected thoughts, ideas and projects from our five Private Lands Wildlife Biologists (PLWBs) and three QRI Team Leaders. the Commonwealth. From the Eastern Shore to Lee County in the West, we continue to see habitat projects being completed on the ground, most especially in our six quail priority areas. At this point we are beginning to see “quail quilts” of habitat pieced together, providing excellent areas for quail recovery to occur, and we hope that the best is yet to come. The spring 2014 issue of the Upland Gazette, published by the North Carolina Wildlife Resources Commission. The fall 2013 issue of Missouri’s Covey Headquarters News. North Carolina’s fall issue of their Upland Almanac has some great information on the impact on songbirds of converting fescue to native grasses, a story on exotic species and research on impacts of growing season prescribed fire in longleaf pine stands. Freelance outdoor writer Wade Bourne writes about the National Bobwhite Conservation Initiative in the September/October 2013 issue of Shooting Sportsman. North Carolina quail coordinator Mark Jones provides an excellent, in-depth look at predators, their impact on quail … and what the real answer is to predator impacts on a landscape level … in this issue of the Upland Gazette.